(Nanowerk News) One of the difficulties of fighting cancer is that drugs often hit other non-cancerous cells, causing patients to get sick. But what if researchers could sneak cancer-fighting particles into just the cancer cells? Researchers at the Georgia Institute of Technology and the Ovarian Cancer Institute are working on doing just that. In the online journal BMC Cancer they detail a method that uses hydrogels - less than 100 nanometers in size - to sneak a particular type of small interfering RNA(siRNA) into cancer cells. Once in the cell the siRNA turns on the programmed cell death the body uses to kill mutated cells and help traditional chemotherapy do it’s job. Many cancers are characterized by an over abundance of epidermal growth factor receptors (EGFR). When the EGFR level in a cell is elevated it tells the cell to replicate at a rapid rate. It also turns down apoptosis, or programmed cell death. 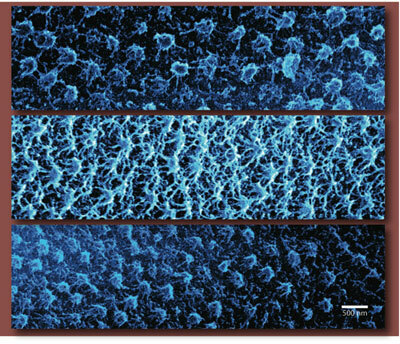 An artistic rendering of hydrogel nanoparticles. “With our technique we’re inhibiting EGFR’s growth, with small interfering RNA. And by inhibiting it’s growth, we’re increasing the cells’s apoptotic function. If we hit the cell with chemotherapy at the same time, we should be able to kill the cancer cells more effectively,” said John McDonald, professor at the School of Biology at Georgia Tech and chief research scientist at the Ovarian Cancer Institute. Small interfering RNA is good at shutting down EGFR production, but once inside the cell siRNA has a limited life span. Keeping it protected inside the hydrogel nanoparticles allows them to get into the cancer cell safely and acts as a protective barrier around them. The hydrogel releases only a small amount of siRNA at a time, ensuring that while some are out in the cancer cell doing their job, reinforcements are held safely inside the nanoparticle until it’s time to do their job. Cells use the messenger RNA (mRNA) to generate proteins, which help to keep the cell growing. Once the siRNA enters the cell, it binds to the mRNA and recruits proteins that attack the siRNA-mRNA complex. But the cancer cell's not finished; it keeps generating proteins, so without a continuous supply of siRNA, the cell recovers. Using the hydrogel to slowly release the siRNA allows it to keep up a sustained attack so that it can continue to interrupt the production of proteins. “We’ve shown that you can get knock down out to a few days time frame, which could present a clinical window to come in and do multiple treatments in a combination chemotherapy approach,” said Lyon. “The fact that this system is releasing the siRNA slowly, without giving the cell time to immediately recover, gives us much better efficiency at killing the cancer cells with chemotherapy,” added McDonald. Previous techniques have involved using antibodies to knock down the proteins. “But oftentimes, a mutation may arise in the targeted gene such that the antibody will no longer have the effect it once did, thereby increasing the chance for recurrence,” said McDonald. The team used hydrogels because they’re non-toxic, have a relatively slow release rate, and can survive in the body long enough to reach their target. “It’s a well-defined architecture that you’re using the intrinsic porosity of that material to load things into, and since our particles are about 98 percent water by volume, there’s plenty of internal volume in which to load things,” said Lyon. Currently, the tests have been shown to work in vitro, but the team will be initiating tests in vivo shortly.